Now that most non-conference games in 2017 are complete, we take a moment to explore the National Championship picture using our model to assess likelihood of teams go undefeated or emerge from their respective conferences. The last two weeks have certainly complicated the Ohio State vs. Alabama match-up everyone was sure of at the beginning of the year. Alabama remains the most likely power-5 team to finish unblemished as the usual cast of SEC contenders keeps tripping up, though there is at least one giant red-flag remaining on the schedule. Between Auburn’s woeful O-line performance and LSU’s face-plant in Starkville these past two weeks, the only date I’m worried about is when the Tide travel to Starkville themselves. Bama still goes into the SEC championship game at 12-0 in 40% of our simulations, down from 52% last week. No other SEC teams are undefeated in more than 1% of simulations, but if Mississippi State survives the next two weeks, they will be on the board. The B1G conference grows more and more interesting each week. As we discussed in last week’s podcast, the likelihood of Ohio State to bounce back from the OU game seems pretty good (hey, remember 2015 when we all left them for dead after Va Tech?). The model has OSU winning out 32% of the time. The rest of the conference? Wisconsin (18% undefeated) and Penn State (9%) look great but are untested, and Michigan (1.5%) is lurking as well. Sadly NU’s slim chances went down in flames in Durham. The reality is a B1G playoff berth comes down to the conference championship game – OSU and Penn State are heavily favored over Wisconsin. The hype is real in my old stomping grounds of Texas and Oklahoma. After a disaster against Maryland, Tom Herman is back on everyone’s minds having still not won a meaningful game in burnt orange. Last week everyone handed the Sooners the conference crown, but now the annual match-up at the Cotton Bowl has a bit more juice. However there are some folks in a different color orange who would scoff at this story line. Our model likes Oklahoma State (8%) more than Oklahoma (4%), partially on account of Bedlam being in Stillwater. The focus on the Red River Shootout has somehow left OK State as the 3rd wheel (a team that was 1 bad call away from a potential Playoff berth last year). Smart money is on the Cowboys right now, though a rematch with the Sooners in the B12 championship game would be a likely tossup. The ACC, billed to be a wild-ride this year, is suddenly dull. Clemson is so far beyond the competition this race seems already over. Florida State (2% chance to win out) has a great defense, but is in deep trouble having lost QB Francois. I had hope for Louisville, but that was far-fetched apparently. Kelly Bryant looks like a Deshaun Watson clone running that O and the defense is just nasty. 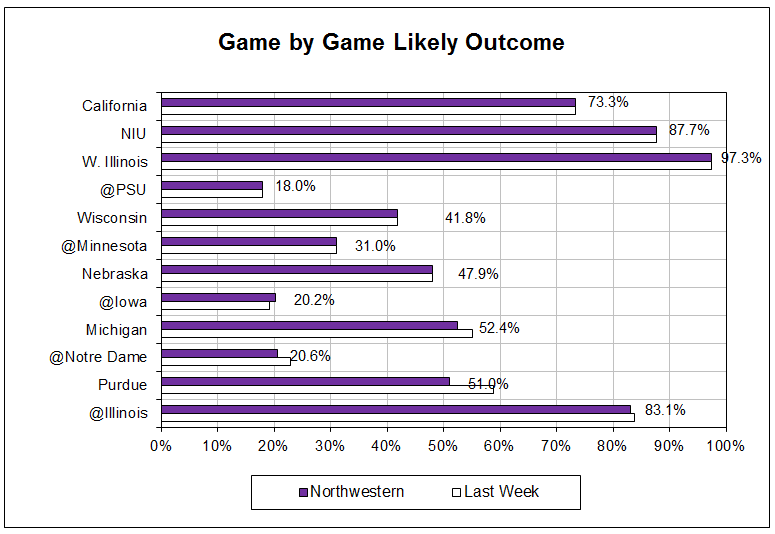 Finally, out west, USC (7%) appeared to be a juggernaut but now looks vulnerable coming off Saturday night’s game. Washington (39%) is clearly in the driver’s seat in the North but hasn’t been tested. 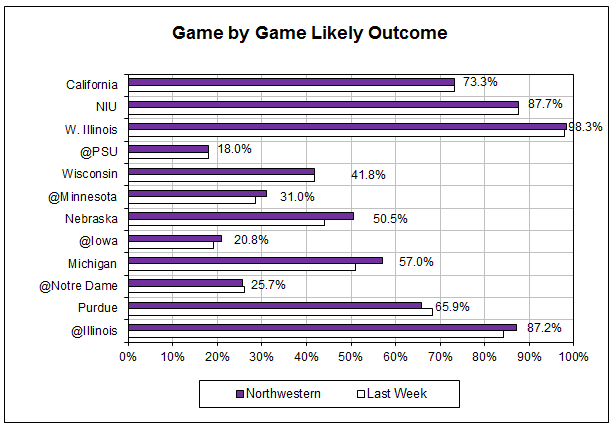 They wouldn’t meet until the Pac 12 championship game where the model heavily favors the Huskies (74%) at present. I’m starting to think USC is good, but not great (look at what happened to Stanford). Darkhorses? Sadly, there are few candidates. The four-team playoff and the Power-5 have seen to that. South Florida could end up going undefeated, but doesn’t play anyone of merit (Illinois!). Boise has already lost, and while the model likes San Diego State (42%), UTSA (34%), and Memphis (33%) to win out, none of them have the path that would really garner consideration from the playoff committee. San Diego State is the closest but needs Stanford go on a run in the Pac-12. Should we get some upheaval, one of these teams could see a miracle, but I think two teams from the same Power-5 conference is more likely. A Michigan-Penn State ordeal could have potential. A 1-loss Mississippi State or Georgia as SEC runner-up is always a possibility. If USC lost a really close game to Washington, I could see both getting in. Oklahoma St-OU as two 12-1 teams? Could setup a 3rd game between them this year though. Regardless, it appears to be a lot of familiar team names – the most interesting story is probably Oklahoma State which has come oh-so-close twice in the last five years. Acknowledging the fact that Saturday’s game was probably less painful for me because I was not there in person… that was one of the least enjoyable 2nd halves in recent memory. For me it felt just like 2011 when Persa and co. jumped out to nice halftime leads on Michigan & Penn State, and then failed to score in the 2nd half of those games. It was, however, a phenomenal 1st half — our offense had it’s best half (by scoring efficiency) since the 2nd half against Cal. Not coincidentally we threw 30% of our passes over the middle. In the 2nd half, only 10% of passes went over the middle and the offense stalled like crazy. I won’t belabor the point this week and will get right to the visuals – I’ve plotted Nebraska on our efficiency-vs-middle-of-the-field chart, based on the full game. Note if we plotted just the first half, it would be a full bar to the right of Penn State, and of course the 2nd half would be at zero, way off to the left. I know the entire world is calling for the backup QB, but I find it hard to believe anyone else could succeed given the in-game coaching right now. Some of this certainly falls on Trev, some on the OL, some on the WRs, and some is just the talent of the players we play against. But the OC and WR coaching seems to have gotten progressively worse in the past two seasons, and I believe are at the heart of everything befalling our offense right now. We’re back to very little margin for error in the quest for bowl eligibility… luckily the opponents standing in the way of that are Iowa, Michigan, Purdue, and Illinois, all of whom are extremely beatable. Michigan is very much another Penn State, Iowa is a lesser version of MN, Purdue is somewhat of an enigma – their speed has kept them competitive – and Illinois is just fun to watch, unless you are an Illini fan. There is still a lot to play for this season and to watch for as an NU fan – it just will continue to be frustrating & not particularly pretty at times. Let’s enjoy it for the potential bowl and to watch the stunning beast-mode play from guys like Justin Jackson. Auburn (-17.5) vs South Carolina: USC is 0-6 vs the spread this year. Auburn is a beast at home. This looks like a run-away type game in the 2nd half. Model likes the Tigers by a lot. Michigan (+17) @ Michigan State: Everything says that the Spartans should beat Michigan by 7 TDs here, but I just feel like coming off a bye, the Wolverines dig deep and find some pride to fight back in this game. They do have a defense (unlike IU) and should be able to keep MSU from running away with it. 2 TDs feels about right to both me and the Scuzz Model (and if we’re wrong, the ensuing #BradyHokeFace will be fun too). TCU (-21) vs Texas Tech: After last week’s beatdown of OK-State, I am a believer in TCU. 5-0 vs the spread, and facing a very weak Texas Tech team at home this week. Model likes the Frogs by 26. Mississippi (-3) @ LSU Ole Miss is boasting a defense that is reminiscent of LSU’s 2012 effort… but has to play in Baton Rouge at night this week. This could be exciting, but the fact is LSU’s weak offense is going to get stonewalled by this D. Unless they can outscore Ole Miss on defense and special teams alone, I like the Rebels to stay unbeaten and win by more than 3. Scuzz model has Ole Miss by 9. Minnesota (-6) @ Illinois: This line is clearly low due to MN’s close call vs Purdue last week, the Illini’s solid play vs Wisconsin two weeks ago and their bye last week. 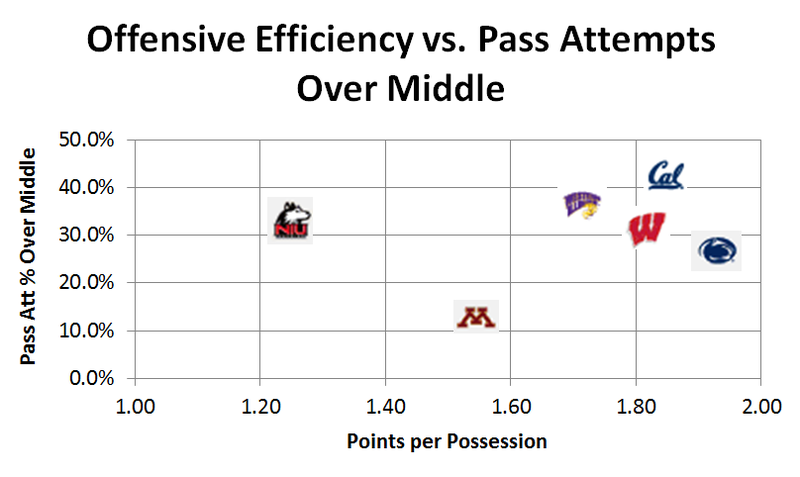 However, I fully believe Jerry Kill was all over his Gophers after they let down on defense last week. Next week is their bye and I think they avoid the look-ahead to Iowa on 11/8 and roll through IL without pausing to take in the Champaign scenery. Model has MN by 11. Finally Obsolete BCS Championship Hunt – Thundering Toward an 8-Team Playoff? Now the realities of the playoff are coming home to roost for the general college football fanbase. Two SEC teams again? Yep, we warned you – it’s not only possible, but probable at this point unless the committee explicitly stops it. Assuming FSU and the SEC champ get in, I personally think Oregon holds the trump card (a thumping of MSU) to secure the 1st one-loss spot. After that, who will you pick? The Big 12 champ? (who by the way lost to Auburn at home) The Big 10 champ? (who by the way got destroyed by Oregon) Notre Dame? Very possible, though they need some help… I just don’t see them getting in over a 2nd SEC team, unless that conference completely devours itself, which means they need Oregon and pretty much everyone else to lose another game. Regardless, the “rematch” potential in the playoff is very high – 2 SEC teams, or FSU + Notre Dame, or even Oregon + MSU should crazy things occur. At this point, can you even rule out 3 SEC teams? I think the playoff has a stipulation for that or at least should… Rule 36.2-B: don’t screw the rest of the county by picking only teams in the Southeast. It was ultimately a frustrating three hours at “The Bank” last Saturday, leaving the Cats to ponder ‘what-if’ after another close loss. This was really just par for the course in the NU-MN series, dating back several years now. There is one game in this series during the Fitz era with a margin larger than one score – the Cats’ 28-13 victory in 2011. Consider also, that this 2014 version is easily the best Minnesota Gopher team of the last ten years. For these reasons, I am not very upset about this loss – NU went into this game with a plan: stop their run, don’t turn it over. You can see that plan in the way we aligned personnel with the situation on defense – rarely did we substitute the pass-rush in on 2nd or 3rd and medium type plays. We also didn’t throw a single pass to the middle of the field until after Minnesota’s big kick return. Reading much of the commentary post-game, however, made me feel like losing was some big aberration, as if we went against an inferior opponent and crapped the bed. Overall, this was a well played game – NU had a game plan, stuck to that plan, and almost pulled out a win on the road against a quality opponent. There were gaffes but the most egregious of which never ended any drives. Well, we didn’t go into as much of a shell as I feared from a run-pass perspective, but we re-tooled our passing game to be ultra conservative. Trevor is getting better at the nice back-shoulder throw to the sidelines, but his best work (in my opinion) this year has been down the seam…. And we didn’t throw a single seam-pass this game. Against UW, we used the WR screen to open that seam up, and when the safety shifts to cover it, it opens up the 8-10 yard up-and-in routes that our outside receivers run; instead, we ran a lot of shallow crosses against MN and threw a ton of balls in the flat – these plays can be successful, but they don’t attack the D and force play in the same way. I’ve been saying since last year, this offense is at its best when attacking the middle of the field – it’s what we did against Cal in the 2nd half and it’s what we did against Penn State. Looking at the passing breakdowns from my charting, the Minnesota game represented a big outlier in percentage of passes thrown over the middle – only 12%, when we have been above 30% in our other games. Not coincidentally, it was also our 2nd worst scoring output based on points-per-possession (the worst being NIU, where we all know we left multiple TDs on the field w bad drops… add 10 points to that score and it’s our best offensive performance to date). Bottom line, to be effective this offense has to get back to attacking the middle of the field, be it a coaching / scheme emphasis during the week, or a play-calling / QB focus during the game. All that being said, Trevor didn’t make any big mistakes (despite being a bit off in his accuracy again – that ankle continues to be a real issue for him), was again good about throwing the ball away, and the Cats almost won this game. I have some other concerns around the red-zone and our scripting coming out of halftime, but I believe the middle of the field is where we can make big inroads. 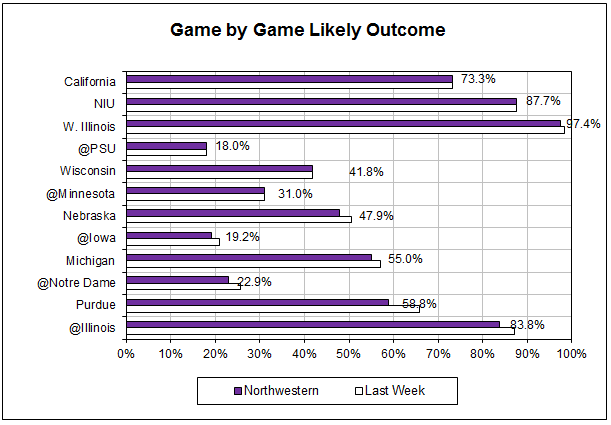 Not surprisingly, NU’s outlook has dropped a bit, due to the poor offensive showing this week. 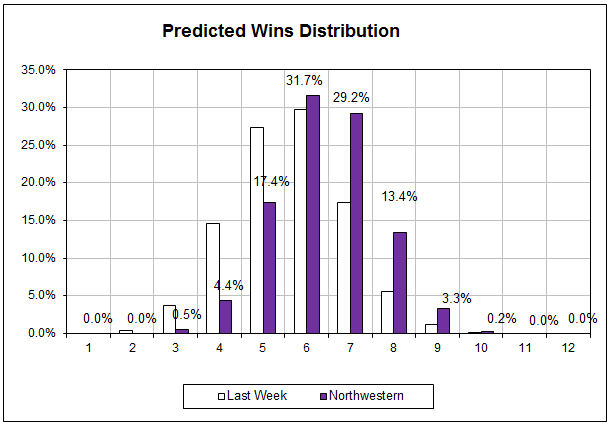 The model still sees NU in a 50:50 situation vs Nebraska this week. The simulation is honing in on 6-7 wins for the season for the Cats, with this Nebraska game being the real pivot point. Washington (+21) @ Oregon: The Ducks are at home and have always had Washington’s number, but 21 seems like a lot against a good D and a coach who has taken you down in the past (as opposed to Sark who can’t seem to beat Oregon). Model likes Nike U by 14. Iowa (+3.5) @ Maryland: Will be very interesting to see what happens in this game… Iowa’s rugged grind vs Maryland’s big WRs. The model has been high on Iowa all year – this week will really answer some questions about how good they can be. Model likes Terrapins only by 1. Kansas State (+10) @ Oklahoma Would feel a lot better about this if it were in Manhattan, but KState absolutely has what it takes to knock off this Oklahoma team, or at least keep it close. The Sooners got beat by TCU, looked marginal against TX, and may be feeling down about their Big 12 and Playoff hopes at this point. Have seen what KState did to Auburn, I really like their chances of keeping OU in check. Model has Sooners by 6. Tennessee (+17) @ Mississippi: Ole Miss is on top of the world after two huge wins in a row. And now they host the lowly Volunteers. Can you say letdown? Tennessee has played a number of SEC teams tough, and will likely lose, but Ole Miss winning by 17 seems high. Model has Rebs by 15. More carnage and we are left with a scant six undefeated teams… shockingly two of which hail from the state of Mississippi. We’re guaranteed to have at least one 1-loss team in the playoff, as ND/FSU and the Egg Bowl will reduce our undefeated pool by two (and let’s face it – Marshall isn’t getting in over a 2-loss team.) I’m very excited for the prospect of two SEC teams and Notre Dame making the cut and upsetting the entire world all over again in the inaugural playoff. Scuzz Model: Badger, Badger, Badger…. Wildcat! Pardon the ancient meme reference to open this post. In fact, I don’t think the word “meme” really existed in the badger-badger-badger-snake era, which is telling because the year 2000 is the last time the road team won in the NU-Wisconsin series. It’s surprising to consider this, mostly because the Ryan Field games have been close affairs while the Camp Randall games have generally been blowouts. Still, the fact remains that NU-Wisconsin is an underrated rivalry and I am thrilled we were able to hold up our end of the bargain this past weekend. I don’t want to be negative, but it was a bit closer to disaster than I would prefer… the 4th quarter in particular brought back a lot of bad memories from a certain trio of games in 2012. Give credit to the Cats as they did just enough to finish of the Badgers – and benefited from an inexplicable pass-play when Wisconsin was on the NU 3 yard line with 8 minutes to play. Luckily for NU, we were able to run the ball on Wisconsin, continuing to use the stretch / zone plays to the outside that started to emerge a couple weeks back. The coaches were smart to hit Wisconsin with the outside run over and over after Marcus Trotter went down with injury, leaving the Badgers thin at ILB. For me that is a bit of a concern going against the Gophers… in the past, this staff has been bullheaded about running, and I fear we overreact to the success against Wisconsin, and open against MN by lowering our head and barreling into the line over and over again… part of the key against PSU and UW was using the passing game to open up the run – we must continue to throw to ball! I also think Minnesota has a better run-D (which is finally healthy albeit losing one key DL for the season) and a worse pass-D (which is missing a starting corner this week) than Wisconsin, so the passing attack will be critical; A game plan similar to Penn State should be the most effective approach. I mentioned on this week’s podcast I thought this was Trevor’s least accurate, but perhaps smartest, performance of the season. The receivers helped him out (unlike in the Cal & NIU games), the oline gave him time, and he got rid of the ball or scrambled to minimize lost yardage when the protection broke down. His ankle is a real concern going forward, as it limits the zip he can put on the ball and can result in a high release – you’ll recall last year against Minnesota, a back-breaking interception from their LB on a slower-than-ideal-pass. Still, Trevor was spectacular in several spots (final 3rd down play to Vitale & earlier when he checked off Vitale in the flat to find Prater on a cross – these were two of his best plays all year) and like I said had a very smart game decision-wise. If he stays quick mentally and gets the protection he needs, I think the offense will be fine. No pass chart this week, as I left it at work, but let me assure you it wasn’t much to look at. NU did not attack downfield nearly as much as in the three previous games – I suspect in part due to the success of the run game. Sweet spots continue to be short passes to Trevor’s left side, and the seam pass to the TE. I noticed that we had some nice crossing routes to Prater that were thrown in stride (not behind him), and utilized his size when covered by a CB and his speed against the LBs. NU will need to successfully exploit this mis-match when defenses concentrate on taking away Jones & Vitale on the opposite side. Would love to see us figure out how to find Prater in the EZ when the field is compressed, but that is easier said than done, it seems. 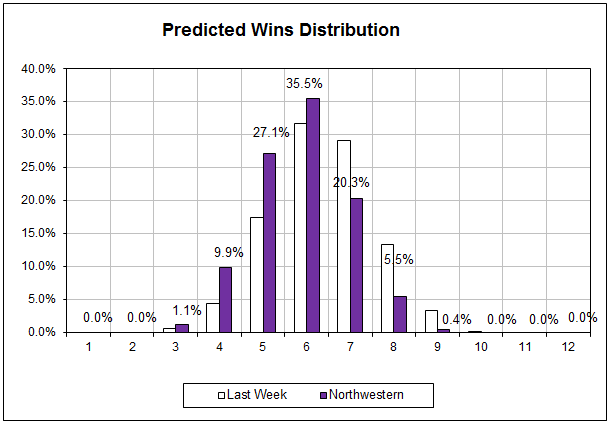 NU’s statistical profile rose again, though less dramatically, as the model already gave the Cats a 40%+ chance of beating UW. 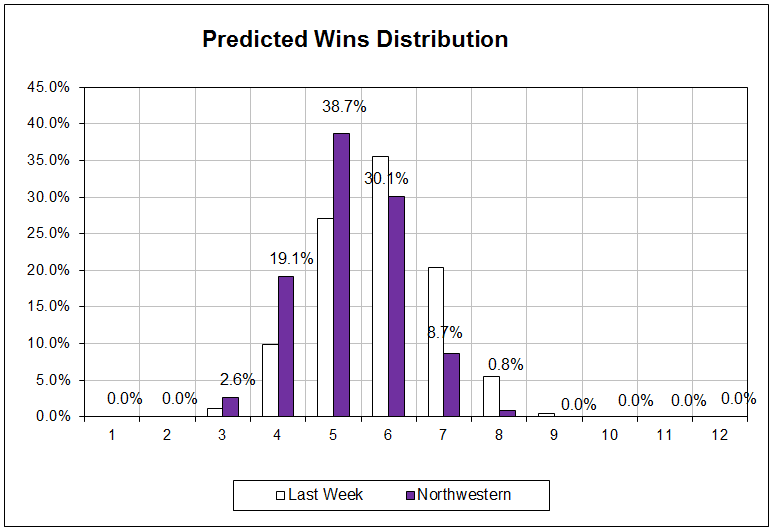 The simulation now gives NU a 78% chance of getting to 6 or more wins and becoming bowl eligible, and 46% of being above .500 on the season. Washington State (+17) @ Stanford: At this point, you have to expect Connor Holliday & Wazzou to lose every game in offensively-explosive and excruciatingly-painful ways. Stanford’s offense is rough around the edges and I expect this to be close. Model actually likes the Cardinal, but I’m going against it this week. North Carolina (+17) @ Notre Dame: North Carolina has completely face-planted this season, and at this point this game is one of the few remaining things they have left to play for. The Irish, on the other hand, are coming off an emotional, physically-taxing game against Stanford, plus have to be thinking about next week’s matchup w FSU. Model likes ND by 9. UCLA (+2.5) vs Oregon: This game pits two terrible offensive lines against one another, and pretty much leaves the winner in great shape to survive this conference. UCLA’s loss last week does not make anyone feel good, but I think Oregon has problems everywhere other than QB. The Bruins have the athletes to keep up (Ishmael Adams, anyone?) and I think were caught looking ahead last week. Model likes UCLA by 6. Penn State (+1) @ Michigan I legitimately thought that Michigan would get it done last week versus Rutgers (however, I certainly hoped they wouldn’t). This week, I am confident that Penn State puts the final nail in the Hoke-experience in Ann Arbor. The Lions have had a week to prepare & get healthier on the Oline. They still will probably struggle to run the ball, but not as much as their opponent… this Michigan team has no punch left, and having lost their best running back to injury is now just waiting the inevitable. Model favors Michigan by 3, but I am picking PSU. Auburn (-3) @ Mississippi State: I want nothing more than a Bulldog victory in this game. However, against a proven opponent, who will present a much greater challenge than they have yet faced, on gameday, after a big win…. It’s just hard to stay on the MSU bandwagon this week. Should they pull it out… whoa nelly, but I just don’t think it happens. Model has Tigers by 5. That’s what I call taking care of all the family business in one day. A massive day of upsets, awesome finishes, and college football drama leaves us with scant few remaining undefeated teams. Many of those remaining are in tough spots this week too… Baylor facing TCU, FSU at Cuse (don’t laugh), Ole Miss and MSU in big spots again as well. You may be thinking that Arizona is conspicuously missing… they are such underdogs in their remaining games (including @ASU, @UCLA) that the model gives them a 0% chance of going undefeated at this stage. Beat USC though and they should show up next week.